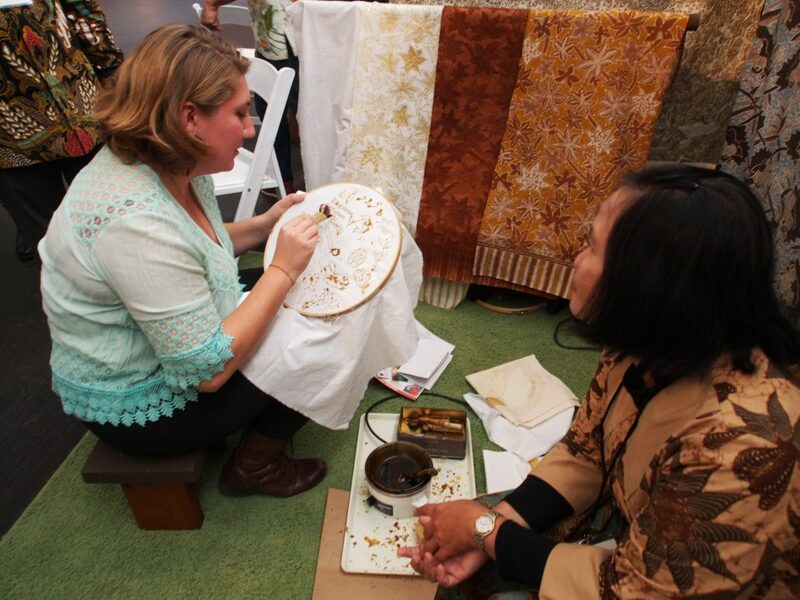 I had the wonderful opportunity to help the office of Indonesian Consul General to bring Bu Dalmini, a batik artisan from Klaten, Central Java to the US for the first time to showcase the art of batik. 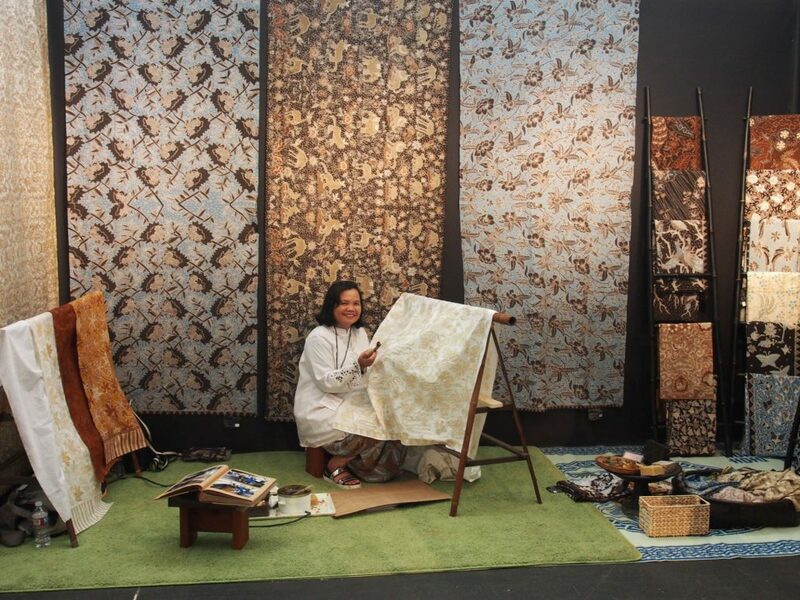 She’s the director of a collective of 169 women batik artisans from 5 villages in Central Java called Kebon Indah. 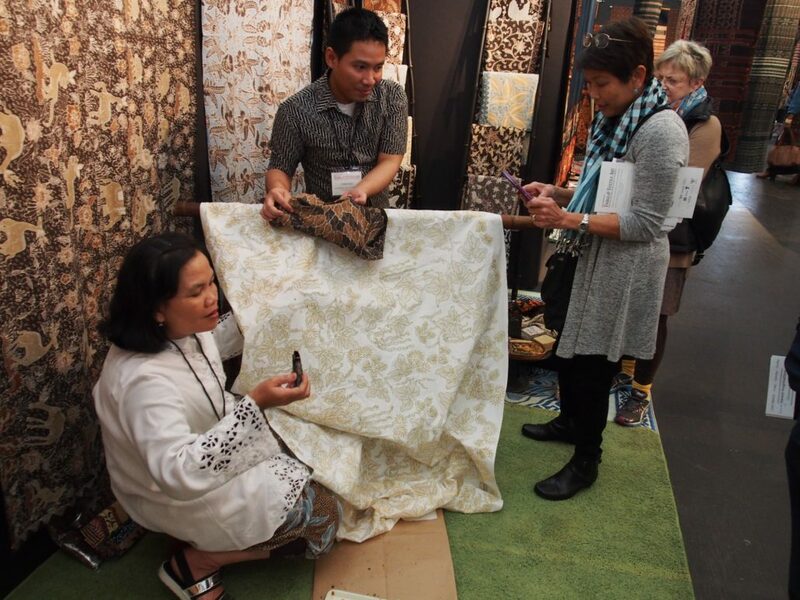 She gave demonstrations of batik making at the 30th annual San Francisco Tribal Art and Textile Show as part a special exhibition acknowledging it as a source of some of the world’s great art treasures. 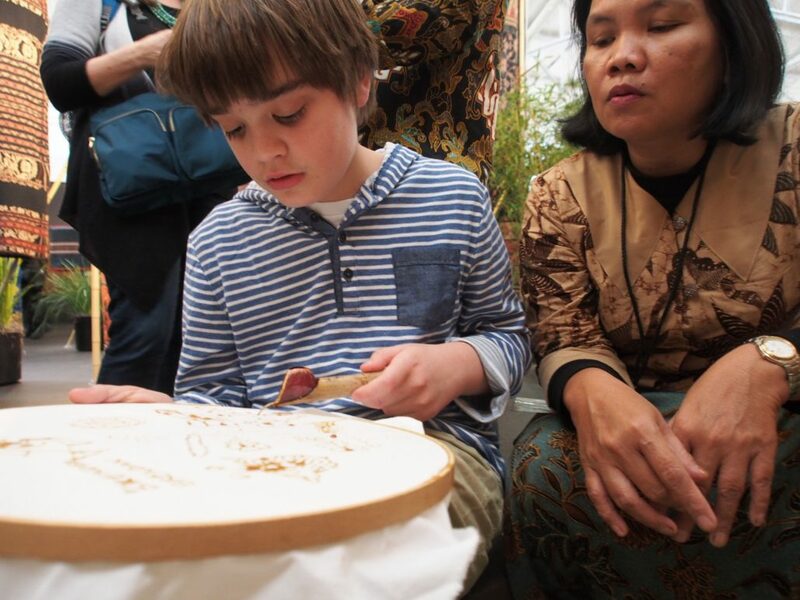 Together we gave presentations at a batik event sponsored by the Indonesian Consul General at Wisma Indonesia, at the Center for SE Asian Studies at UC Berkeley, and at several workshops for textile artists and for children. 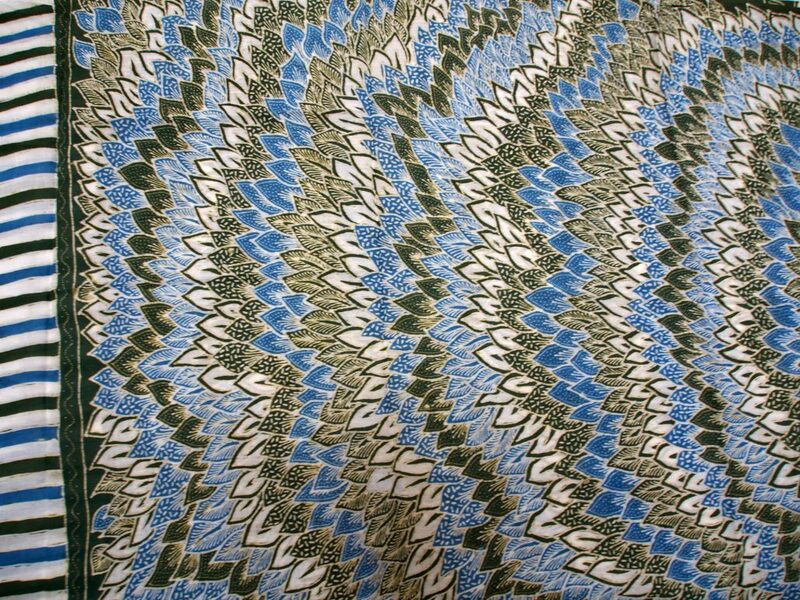 She is a consummate artisan but also a dedicated and very respected leader who helped organize the women of her community after the devastating earthquake into a collective to rebuild the batik home industry that had been destroyedShe brought many examples of the batik made by the collective. 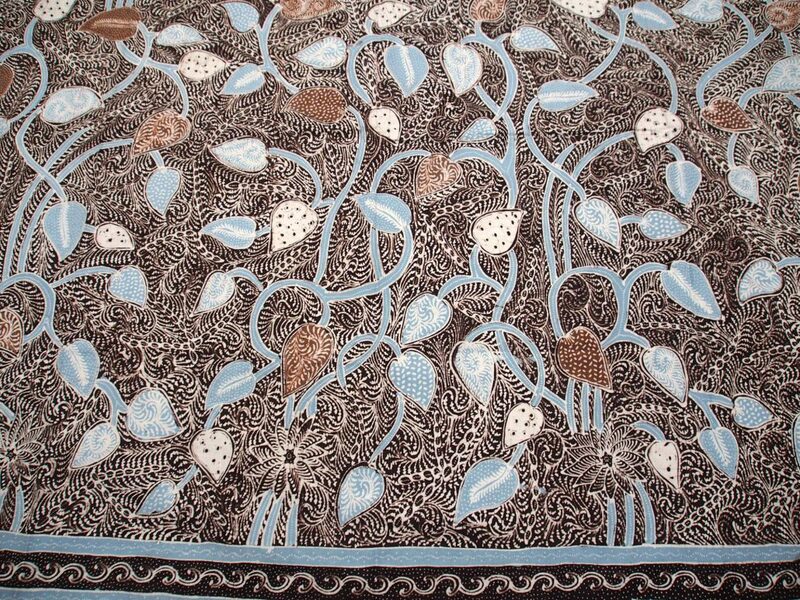 The motifs reflect the nature and fauna from the forest and rice fields that surround the village, and the colors are made from natural sources such as leaves of the mango tree that can be collected nearby. 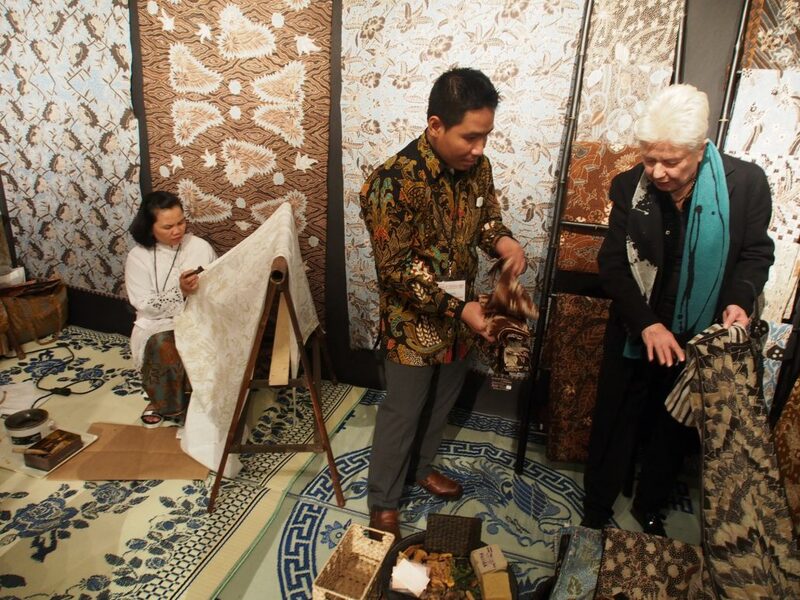 The show provided a first time showcase for the range and quality of naturally dyed hand drawn batik from Kebon Indah in the US. The reaction was overwhelming. 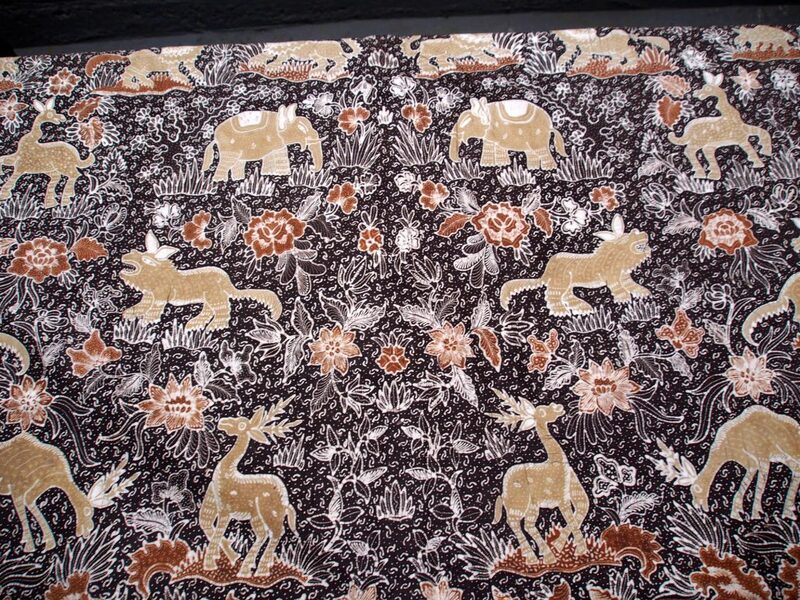 It seems that seeing an artisan actually working on a piece gave a new understanding, and value to batik. 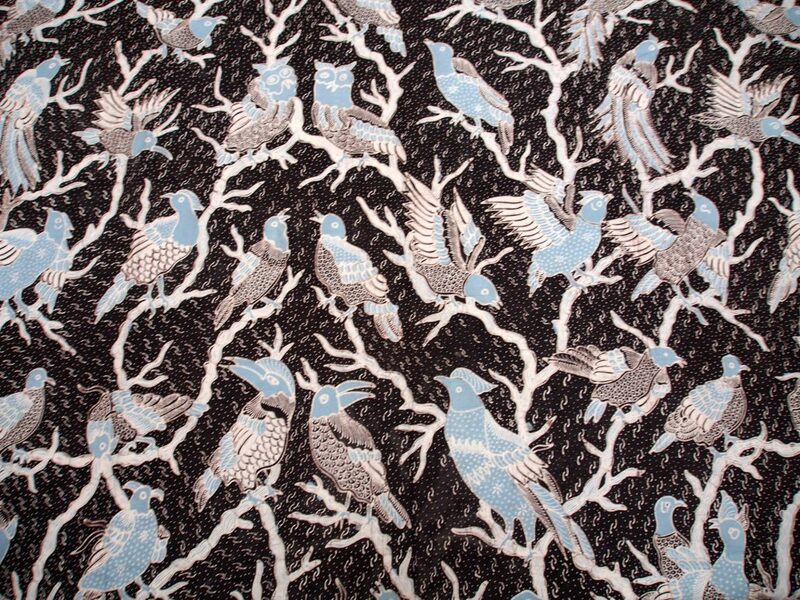 Alas-alasan, animals in the forest. 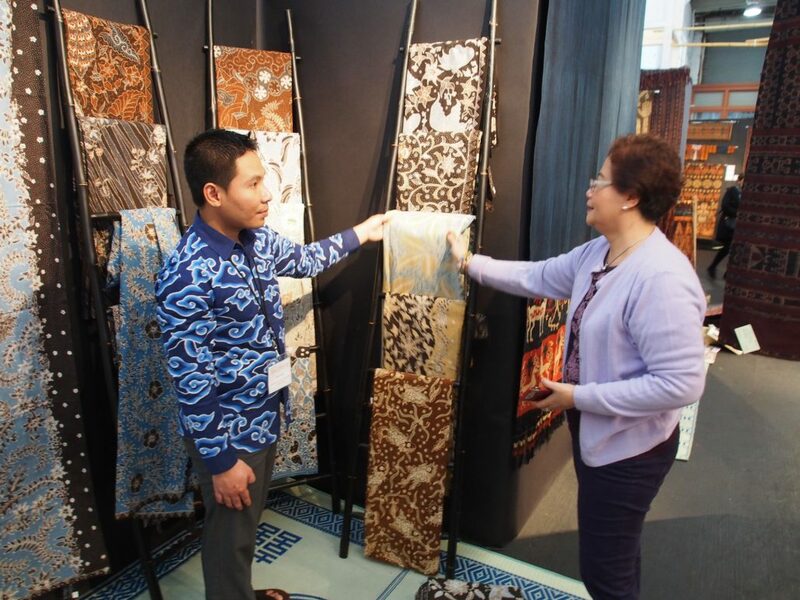 Daun siri These smart shoppers snapped up the most complicated batik, requiring three colors and multiple waxings. It would be expected, as they are Indonesian. 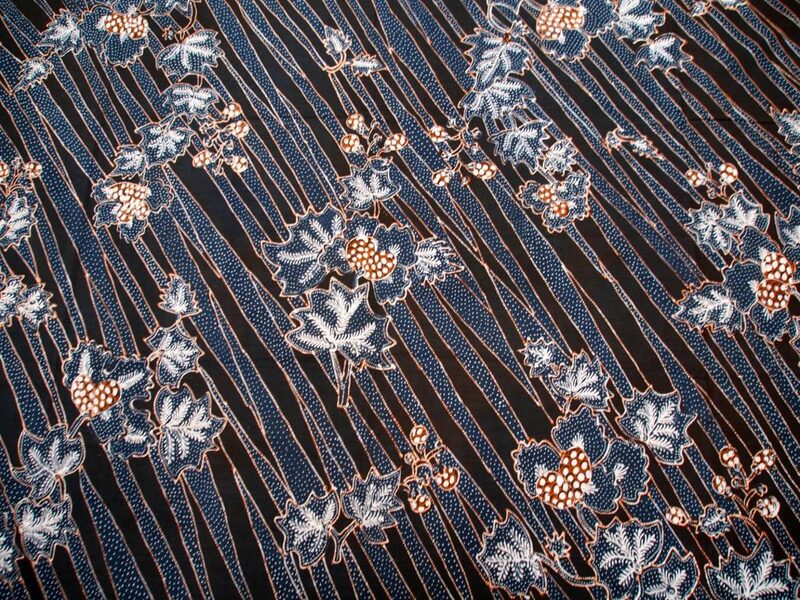 Fendi wears a batik tulis mega mendung batik, a traditional cloud pattern from Cirebon, West Java. 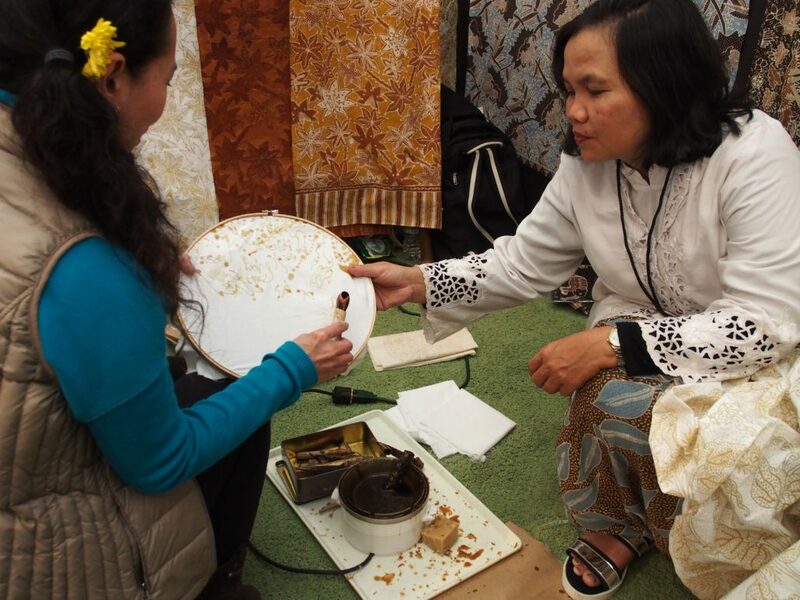 Bu Dalmini is applying wax to a kain panjang, long cloth, a traditional format used for a hip wrapper by both men and women throughout Indonesia. 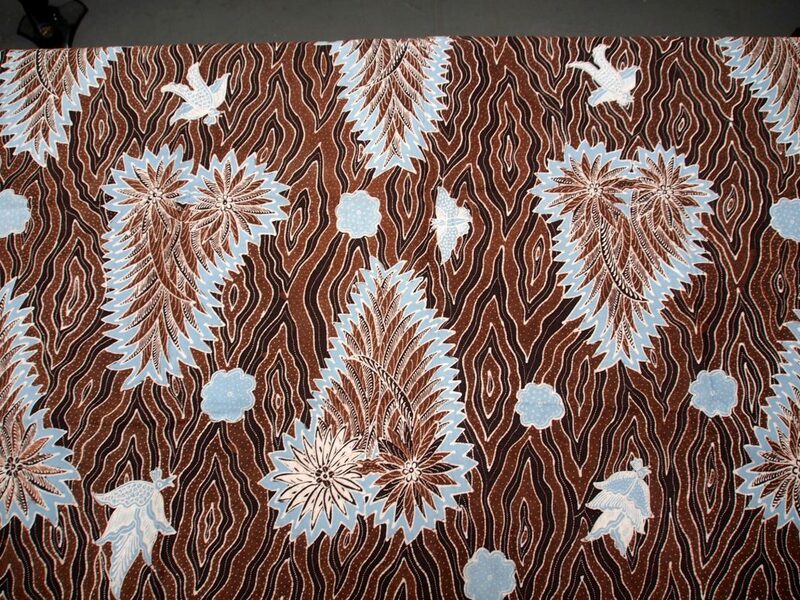 The Tribal Art and Textile show draws batik collectors from all over the world. 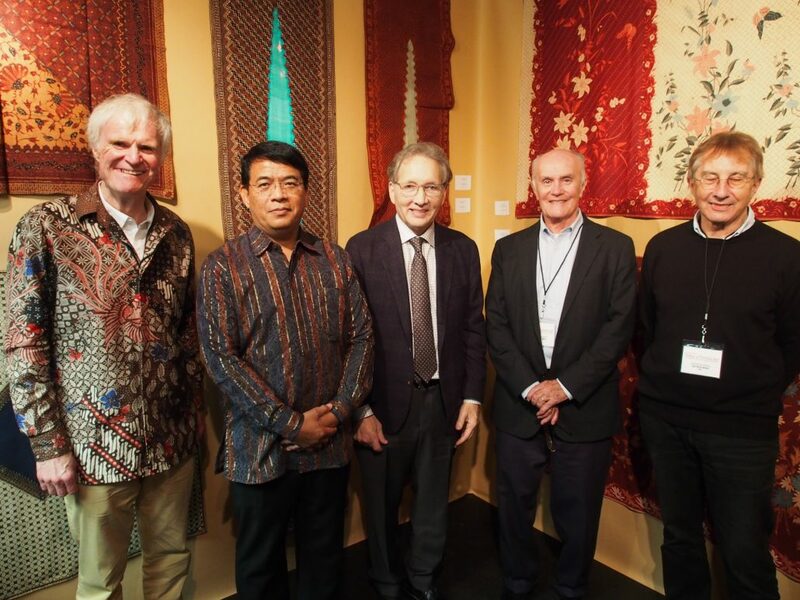 Pak Ardi Hermawan, the Consul General of Indonesia, second from the left, along with Rudolf Smend on his right, a batik collector from Cologne Germany, and Dr.Donald Breyer, Don Harper, and Christophe Musial in Rudolf Smend’s booth. 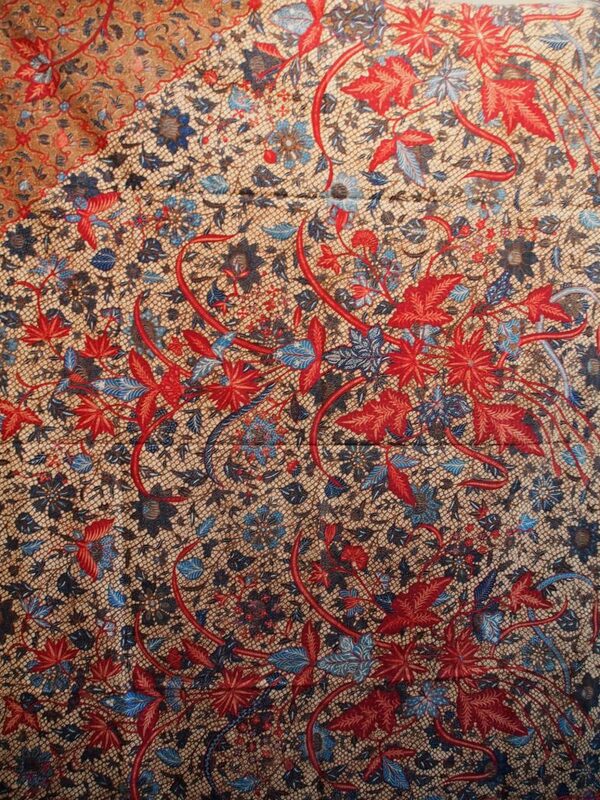 One of the beautiful antique batiks on display at the show. 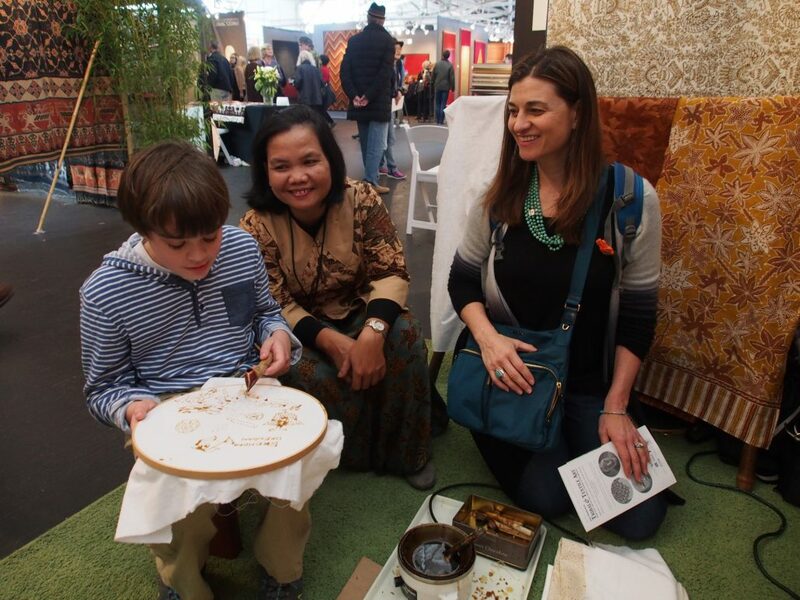 Bu Alfonsa Horeng, a weaver from Flores,also sponsored by the Indonesian Consulate, who also demonstrated her skill at the show as part of the special exhibition of Indonesian art. 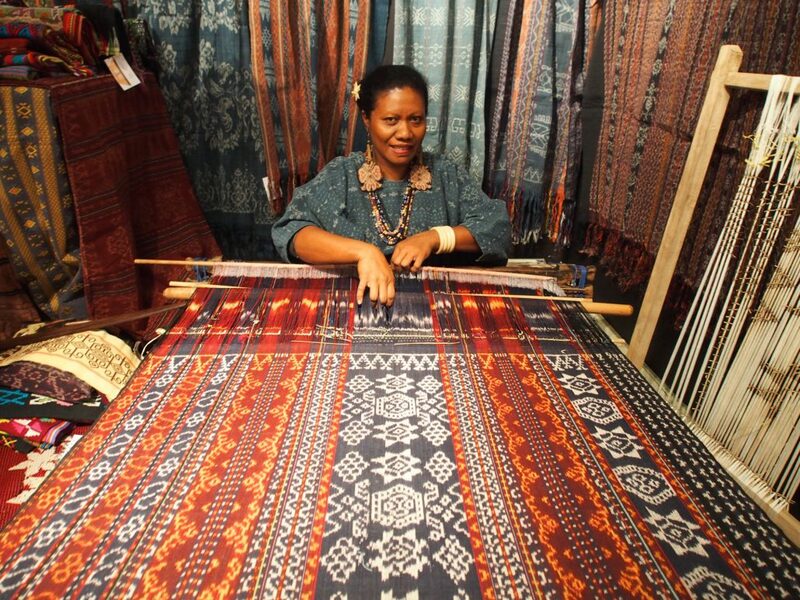 Bu Dalmini is a tireless educator as well as a skilled artisan. 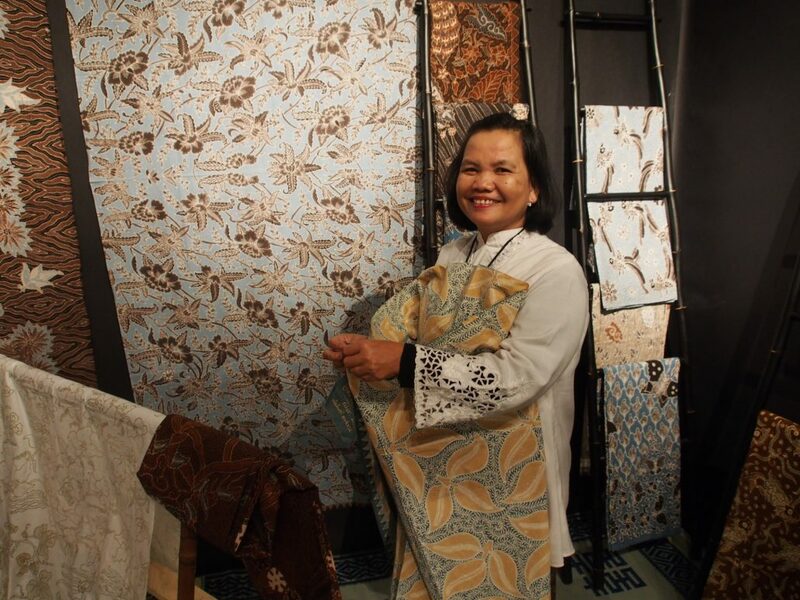 She teaches batik in schools and villages all over Java. 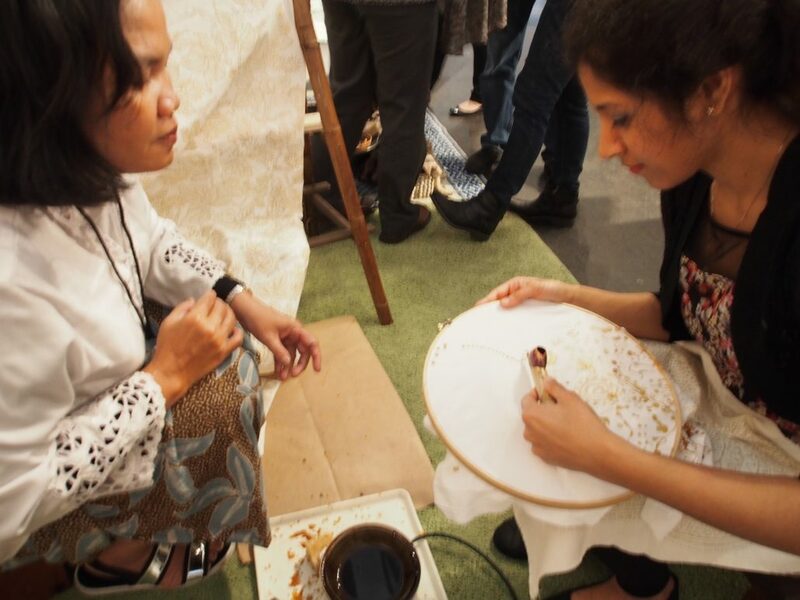 She is especially focused on empowering young women to be batik entrepreneurs like the women of Kebon Indah. 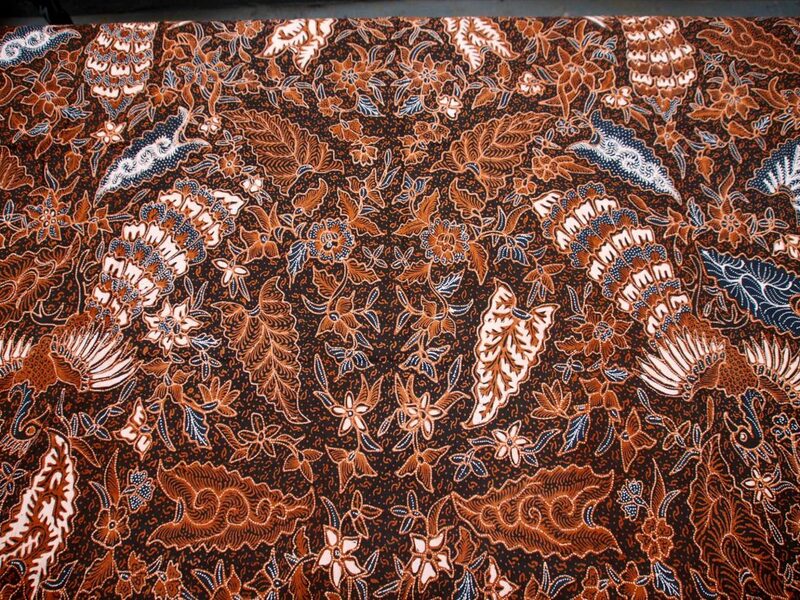 In the background are three cloths, each a stage in the batik process beginning with the drawing on the plain white cloth, the waxing in the second, the first color in the third, and the finished cloth is number four. 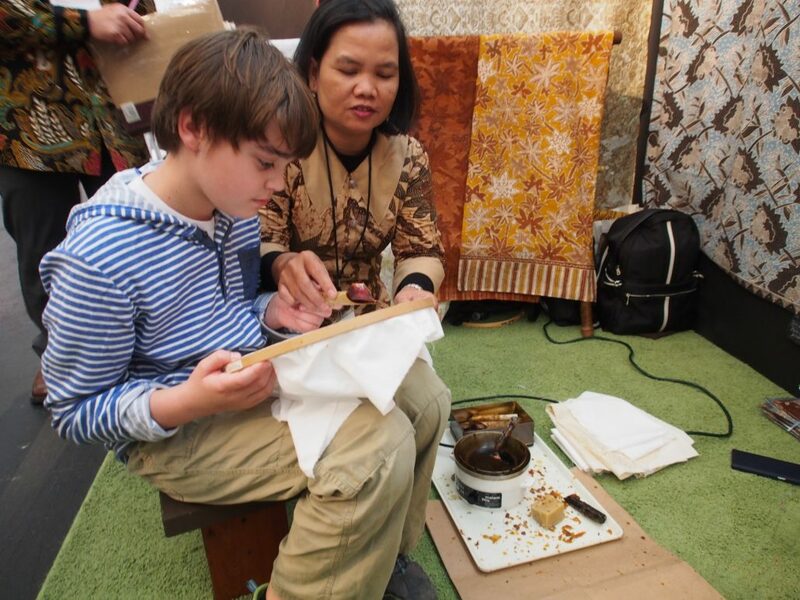 Brandon who is 7 years old, receives his first instruction in applying the wax from Bu Dalmini. She often teaches children in the public schools in Indonesia. 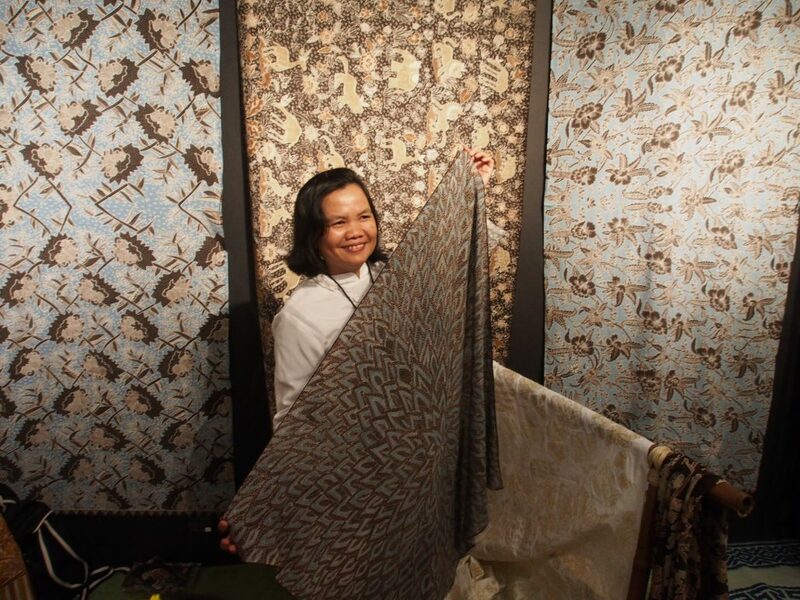 Her special mission is to instill an appreciation for Indonesia’s national treasure. Brandon expressed a considerable knowledge of Indonesian geography and culture. His mother brought him to the Tribal show because of his curiosity about foreign culture. 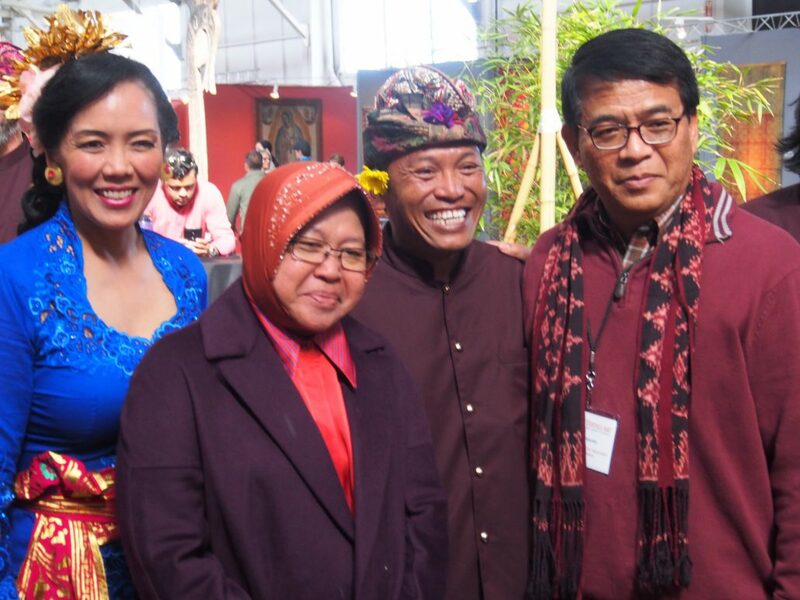 A special guest at the show was visiting dignitary and special guest from Indonesia, Tri Rismaharini, the mayor of Surabaya, Indonesia’s second largest city, with Bapak Ardi Hermawan, Consul General, and Pak and Ibu Susilo, directors of Gamelan Sekar Jaya. 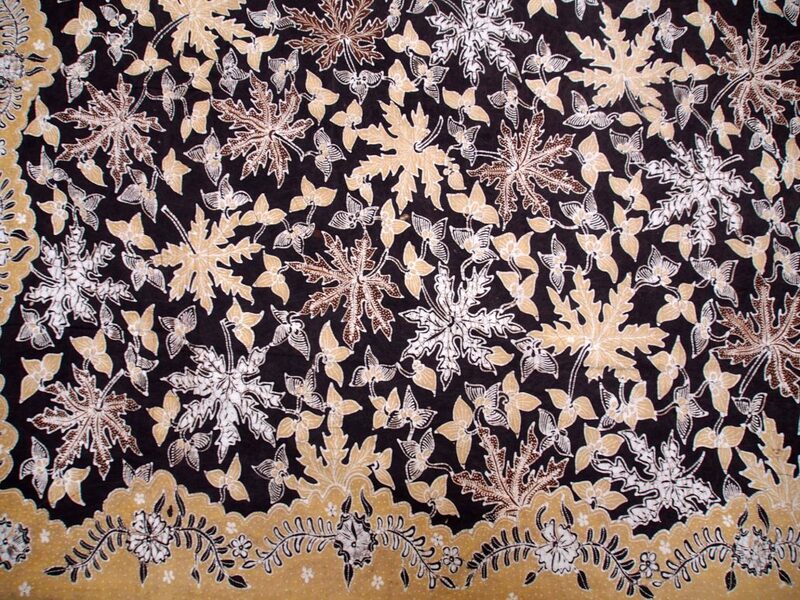 There are many variables affecting the flow of wax on cloth. It requires a steady, patient hand. 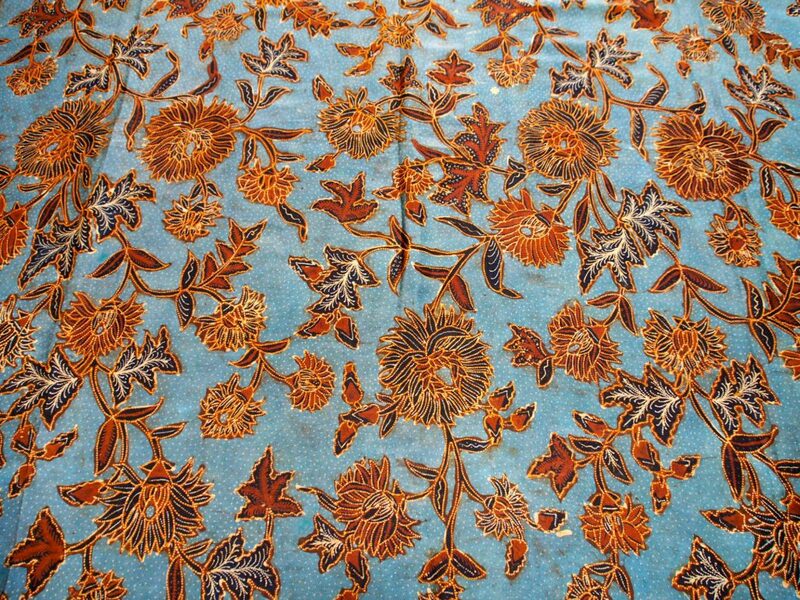 The composition of the wax, the temperature, the angle at which the canting his held, the type of cloth, all have an effect on the flow. Once the student has mastered applying small dots, short even lines are the next challenge. 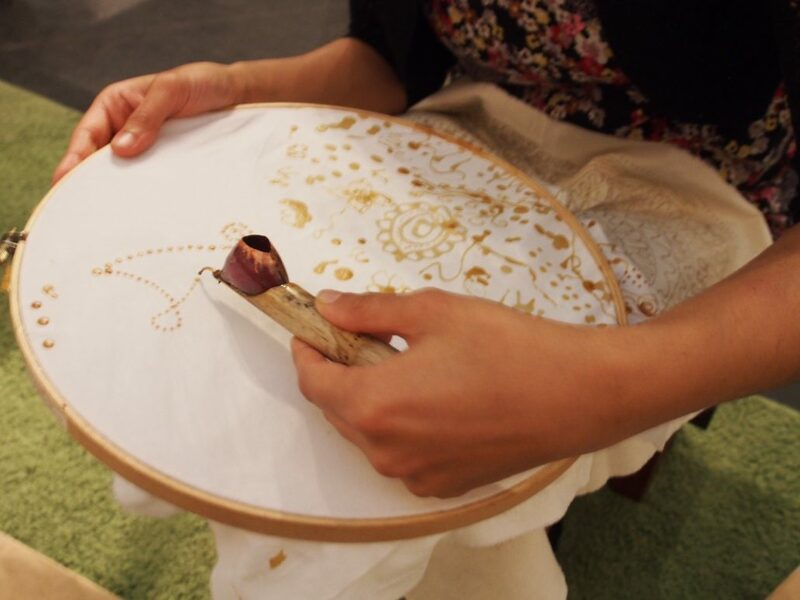 Bu Dalmini tirelessly applied wax with canting on the cloth for the three days of the show, shared her knowledge, and demonstrated that Indonesian people are the friendliest most generous people in the world.